Ben says I have an addictive personality. In terms of food I like to think of it as having food fancies, and when I’m food fancying something I have to have it over and over again. 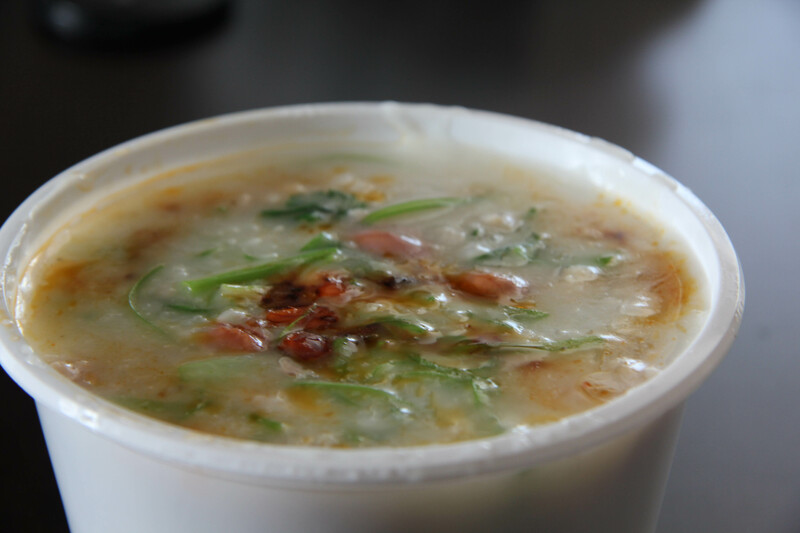 Right now my food fancy is the Minced Pork and Fresh Oyster Congee from the Congee Noodle House. I’m a big congee fan, but up until a few weeks ago my congee staples have been the BBQ duck, seabass & cilanto and occasionally the mixed seafood. I tried the Pork & Oyster a few weeks back and I can’t get it out of my mind. So much so, that I’ve had it four times in the last week! I know I’ll break the “habit” soon, but at the moment I can’t think of anything better to eat. The white pepper seasoned minced pork combined with the little nuggets of chopped oysters may not sound delicious, but trust me it is. Alright, you’ve convinced me! I have to try the Congee House. Great blog, excited for your next post. So… have you tried it? Of course, it was delicious. the pork and oyster congee was very tasty, thanks for the suggestion!